Community Blog by lostleader // 3 down, 57 to go! Hello Dtoid, I've come back to you to talk about the first 3 games I have beaten for my 2012 resolution! Sorry it took a bit, Dragon Quest IX got in the way, but no matter, here they are! 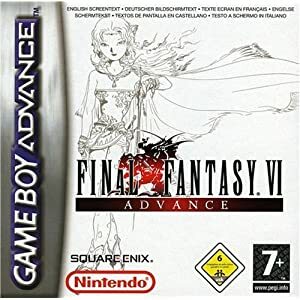 After dragging my feet for the longest time to beat this final fantasy simply because the last dungeon was long and I got stuck on it, I have to say I enjoyed this game thoroughly. Kefka really makes this game for what it is, and honestly this game would be horrible without him. There�s just something about the horrid beast that makes me glee with excitement each time I saw him appear on screen. Aside from Kefka, I also liked the duality of the world of balance and world of ruin. It was neat to see the contrasts between the two worlds and how the game itself kinda flipped gears from simple story telling to a wide non-linear adventure of getting the gang back together. World of ruin didn�t feel like a clich� dark world either, but rather one that truly was ruled when the bad guy won, chaotic and full of despair. Overall I just love all the little things you find out during the second half of FFVI that makes going through the first part far more interesting. Don�t get me wrong though I find the world of balance far more interesting in terms of story and the way they set up characters which makes the whole ride worth it. My two favorite parts in the game were the Cyan and Kefka arc and the opera scene with Ultros. As for what I didn�t like, well, what was the deal with Terra/ Celes? There both main characters at the same time, yet not, it was just very off putting. The magic only dungeon pissed me off royally as well; even when I knew the trick to it I still kept dying on my way back, and made me quit playing for quite a few weeks. Kefka�s tower was another annoyance, it�s not exactly that I didn�t know what to do; it�s that I missed what was oblivious. Having to go on youtube just to find out how dumb you are for something you missed really hurts your pride. Shadow�s death was also something I didn�t like, but mainly because I couldn�t go back and save him, please spare me internet I know not what I did. Also was a bit perplexed that the Godess gave me more trouble than Kefka. Conclusion: I have to say that Final Fantasy VI is by far my favorite Final Fantasy after beating it, although I have only played the original and IV to begin with so my attitude may change. I think it blends story, character, and atmosphere better than any other RPG I have played so far. I always liked the Ace Attorney series, so it was a no brainer to get investigations. I dove right into this game as soon as I got it and was able to finish it quite fast. 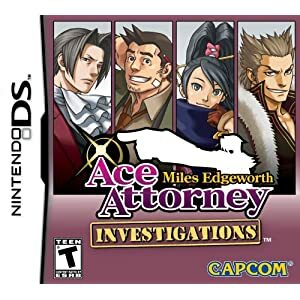 I personally found this game to be quite easy compared to the rest of the series, Apollo Justice and Justice for All gave me a lot more trouble. Never the less the new setting, characters, and gameplay was a nice change of pace. I can�t say I�m a big fan of the logic mechanic though, seems rather shoehorned in compared to other stuff like the magatama and super sensing. The sprite animation was an excellent addition and made interactions a lot more fun to watch. New characters are interesting and I have to say I really like Kay, the �master thief�, and the new antagonist Lang. Edgeworth as the lead also makes for a lot interesting interactions and its fun to see him on the receiving end instead of Wright for once. I have to say I missed the battles in the court though, for some reason debating on the scene of the crime just doesn�t have the same effect for me. The cases this time are a full arc which kinda surprised me; it�s about the KG-8 incident and all the events that come from it, as well as a smuggling ring. I often found myself moving a little too fast for the game and would often glare at it for some of the stupid things it wanted me to line up, but overall it was challenging enough. I also find the suspects for murder rather resist and just won�t stay down, it just gets to the point where you shout out �just give up already!!!�. For the most part though it�s the same kind of Ace Attorney game we have come to love and respect. Conclusion: Ace Attorney Investigations is a great spin off. Totally beats Apollo Justice, and I�d say it�s on par with Justice for All as a whole. Logic is rather tacked on though and the endings to the cases tend to drag a bit, but it�s a fun ride. 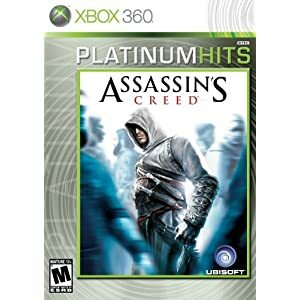 I first experienced Assassin�s Creed when I was in college; I got to play it thanks to some dorm mates next door. I was quite impressed with it both graphically and in gameplay so much so that I decided to pursue a 360, although it wouldn�t be quite some time till I actually regretted buying one. Eventually I did get one but I dragged my feet on Assassin�s Creed because it seemed kinda boring after hearing a lot about how repetitive it gets, and boy does it. But as my 2012 resolution I decided to finally go through it all and I have to say I�m glad I played it. AC really sets up next gen gaming well. It�s big and graphically pleasing. There really is a lot to explore and you can get lost when you do. That�s what makes this game so fun, simply exploring and looking around for your own fun. Assassinating a lot of guards or doing a bunch of roof top stunts. A lot of the fun is honestly missed in the actual missions in the game. I mean once you start playing the story and only the story it gets boring and repetitive. The assassination missions are fine, but info gathering just gets dull. The only thing that really compelled me to keep going was the story itself, which was quite interesting involving some mess with secret societies and government conspiracies, I mean would doesn�t like that? Conclusion: Assassin�s Creed is a good game. Info gathering is rather dull and repetitive, but when you finally get to assassinate your target it�s worth it. However I think Assassin�s Creed truly shines when you just explore the world and create your own fun.